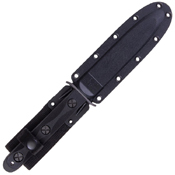 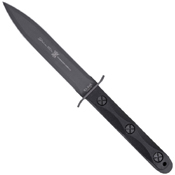 KA-BAR is excited to introduce it's first and much anticipated John Ek Commando Knife Co. product, the Ek Model 4. This updated version of the old jungle fighting knife is made from 1095 Cro-Van and features a parkerized double-edged blade, textured glass filled nylon handles and traditional X-head fasteners. A US-made Celcon® sheath with retaining strap, self-locking function and multiple tie-down points is also included.